Where would you most like to go in South America? You may immediately say Machu Picchu. But South America is home to many other places that are as beautiful as Machu Picchu. Here the list of 8 most beautiful places in South America to visit. With an approximate length of 19 miles and height of 240 ft, the Perito Moreno is one of the largest and most amazing glaciers in the South America. This stunning glacier spread across an area of 97 square miles. It is a part of famous Los Glaciares National Park in Santa Cruz Province of Argentina. Surprisingly, the Perito Moreno glacier still growing by gaining as much as ice it shedding. The actual reason behind this phenomenon still unclear. 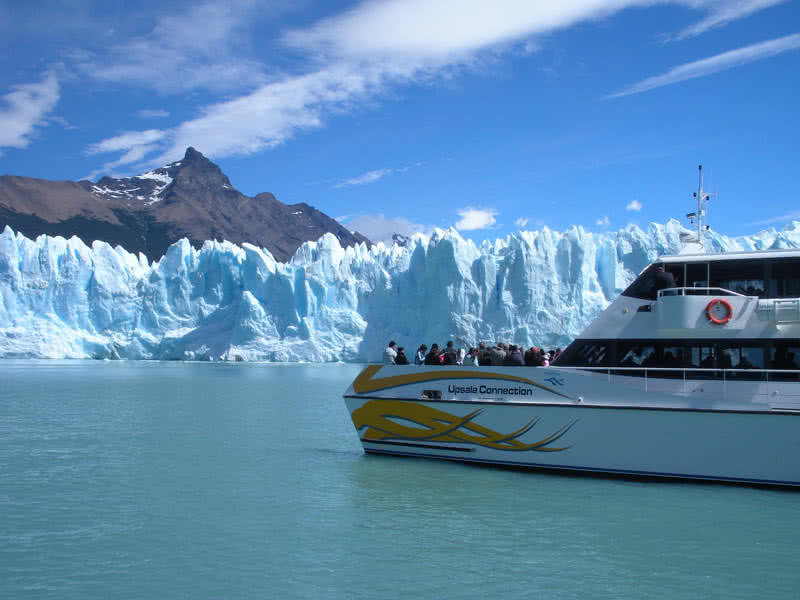 Perito Moreno glacier is the third largest reserve of fresh water in the world. Accessibility is the main reason that make Perito Moreno as one of the most popular tourist attraction of Argentina. Take a boat ride on Argentino lake to get a close view of this natural spectacle. When the weather is hot, you could also see the falling of huge ice blocks from the glacier. The Atacama desert located in the Northern Chile is the most driest non-polar place on Earth. This arid landscape mainly composed of salt lakes, red canyons, dry mountains and sand across an area of 41, 000 square miles. The temperature at the Atacama varies between 26 degree Celsius and -2 degree Celsius. The unbelievably dry Atacama desert receives an average of 1mm rainfall per year. The unpolluted, clear sky makes the Atacama as a best stargazing destination. Several top observatories have been also situated on this desert. The Valle de la Luna or valley of the Moon located 15 km away from the town of San Pedro de Atacama in the Atacama desert is named after its Moon-like landscape. You will see a wide range of sand and stone formations there. Of course, everyone knows Rio De Janeiro is home to ‘Christ The Redeemer’ – a 98 ft tall statue of Jesus Christ that enlisted as one of seven wonders of the world. It is the largest art deco statue in the world and an icon of Rio City. The statue situated 2300 ft high peak of Corcovado mountain. Gazing over the Rio City, this amazing statue of Jesus Christ with open arm symbolizes peace. Rio De Janeiro is definitely among the best beach cities in the world. The Copacabana is the most famous beach of Rio. 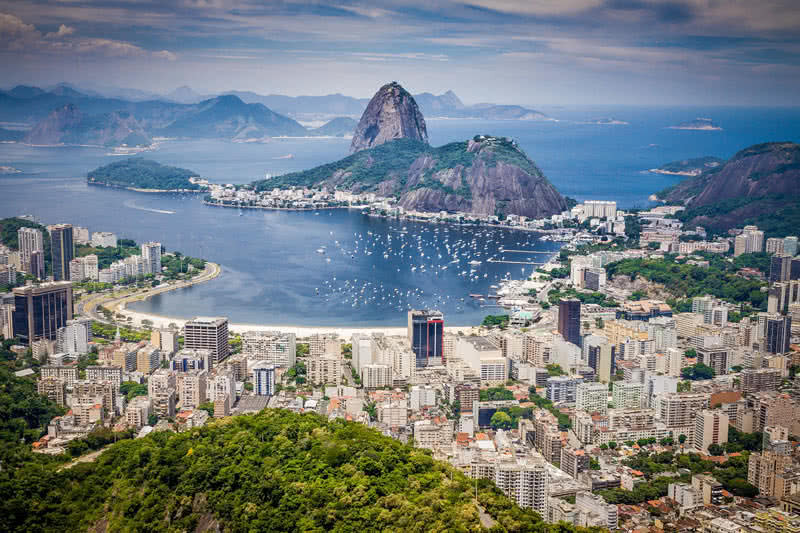 Surrounded by the picturesque sugarloaf mountain, the Copacabana beach stretches over 2.5 miles. The New Year Eve at the Copacabana beach attracts visitors from all around the world every year. There are also many activities for the tourists including volleyball, kite surfing, surfing and bodyboarding. The Rio Carnival is the biggest festival in the world. It held every year 40 days before the Easter, begins on a Friday and end on a Wednesday. This amazing festival attracts more than 2 million people every year. Samba parade is the main attraction of Rio festival. Every year more than 200 different Samba school participate in the parade. Covering an area of 12.4 square miles, the Tijuca forest in Rio De Janeiro is the largest urban forest in the world. It became a National Park in 1961. Tijuca forest is home to hundreds of species of animals and plants. Other attractions in this urban forest are mountainous peaks, waterfalls and caves. At 976 meters, the angel waterfall is the highest waterfall in the world. It is located in midst of dense forest, a part of Canaima National Park located in the Southeastern Venezuela. It is very difficult to get close to the Angel falls as it situated within a dense forest. However with the help of local people you could reach the foot of this amazing waterfall. A helicopter ride over the waterfall is another option. It will definitely bring a breathtaking view of the Angel Falls. The Angel Falls was named after Jimmy Angel, who accidently discovered the waterfall in 1933. In the rainy season, angel falls will split into two different waterfalls. During this time, you could also feel the spraying of water from a distance of 1 km. 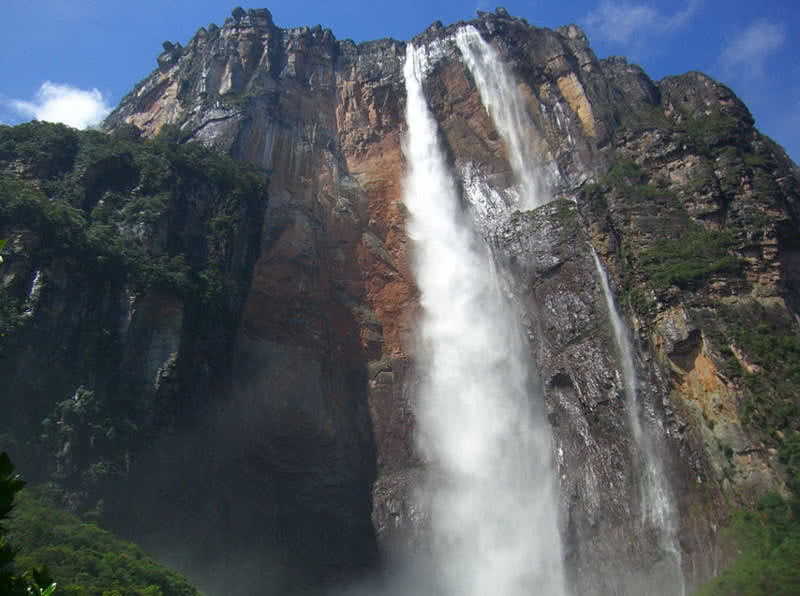 In the dry season, the water falls from the top will get evaporate even before reaching the ground As the Angel Falls is almost 1 km in height. 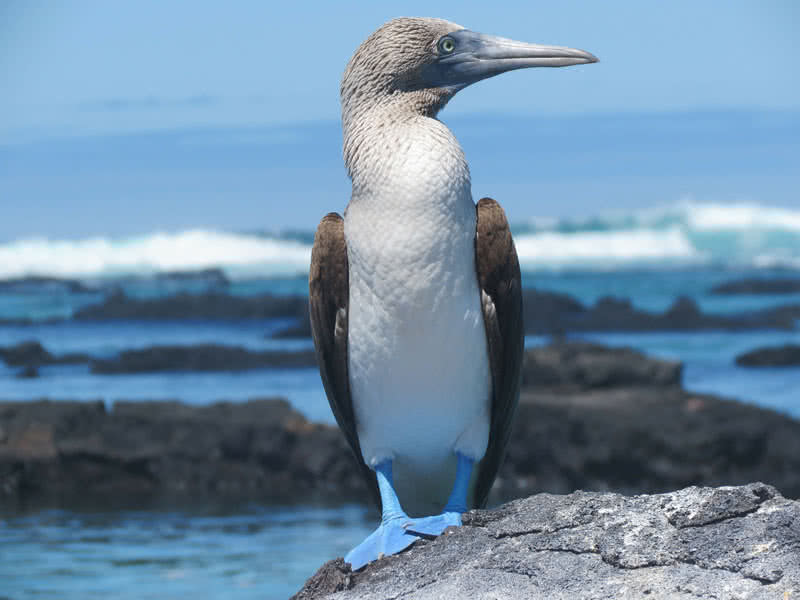 Galapagos is an archipelago that consist volcanic Islands and Islets. This amazing Island located in the Eastern Pacific Ocean, about 620 miles south of the mainland of South America. Galapagos Islands are known for their isolation and unique wildlife. The Isolation and lack of large nature predators make the wildlife in Galapagos Islands so unique, home to many endemic species. The list includes Galapagos tortoise, marine iguanas, Galapagos fur seal, flightless cormorants and Darwin’s finches. The Galapagos tortoise the largest land animal of Galapagos archipelago. A fully grown Galapagos tortoise weigh up to 417 kg. Thus, it is also the largest living species of tortoise in the world. The world-renowned naturalist Charles Darwin visited Galapagos Islands in 1835. That visit helped him a lot for his theory of the origin of species. Galapagos Islands is the point where three ocean current converges – South Equatorial current, Humboldt current and Panama current. It brings a highly variable climate and unique marine to this archipelago. There are accommodations available in different Islands for the visitors. Boat riding is the best way to see the beauty of Galapagos Islands and the unique wildlife. Iguazu falls is truly a watery wonder of the world. This beautiful waterfall on the Iguazu river located on the border of Argentina and Brazil. The 1.67 miles wide Iguazu falls consists of 275 different falls. Most of these falls measure 210 ft in height. Two third of waterfalls of Iguazu falls lies within Argentinian side. Iguazu falls is taller and twice as wide than the Niagara Falls. The average water flow rate of Iguazu falls is 1756 cubic meter per second. It can be reached to the maximum rate of 13000 cubic meters per second depend on the season. 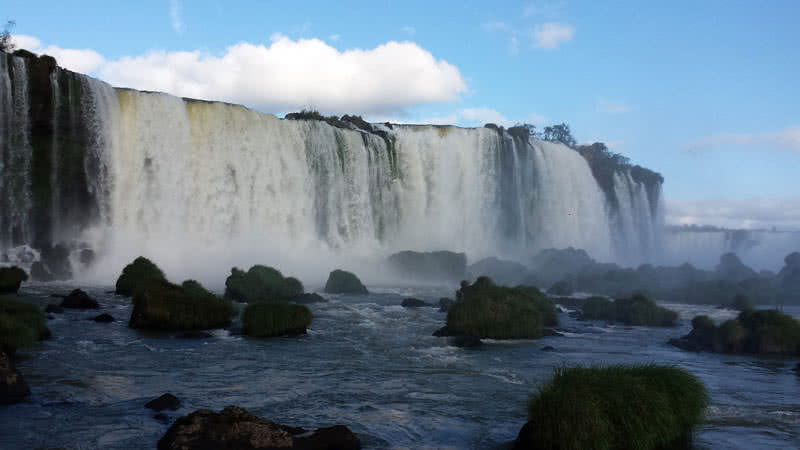 The ‘Devil’s throat’ is the highlight of Iguazu falls. It is a 150 meter long and 80 meters high, U-shaped narrow chasm that includes 14 beautiful waterfalls. The walkways in the site will bring a close view of the amazing Iguazu falls for the visitors. In addition, there are boat services that take you right under the waterfalls. Spread across 4086 square miles, the Salar De Uyuni located in the Southwestern Bolivia is the largest salt flat in the world. The thickness of this salt flat ranges from 2 meters to 20 meters. 70 percentage of Earth’s lithium reserves are also found in Salar De Uyuni. It is truly a natural wonder of Bolivia. Salar De Uyuni was formed as a result of drying up of a lake called ‘Lago Ballivian’ about 40000 years ago. 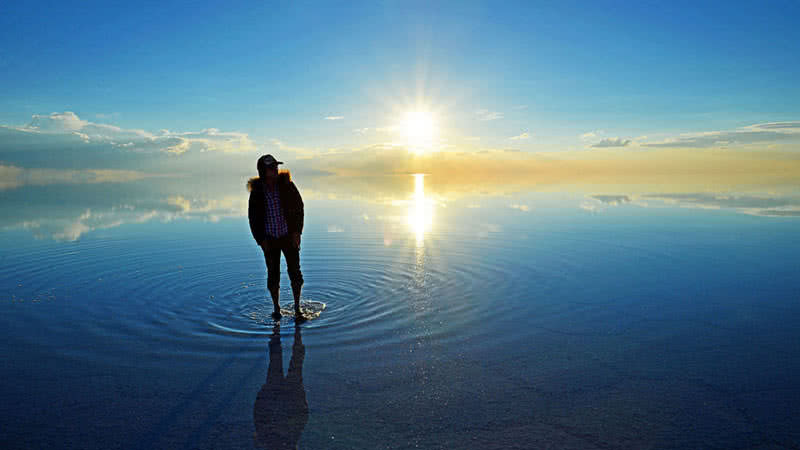 It is said to be Salar De Uyuni contains 10 billion tons of salt. As Salar De Uyuni is exceptionally flat and easily spottable, NASA uses this place to figure the positioning of satellites. In the rainy season, when the vast salt flat become covered with a thin layer of water, Salar De Uyuni clearly reflect the sky above. At that time, this site becomes the largest natural mirror on Earth. The view of a vast expanse of white salts will definitely be an unforgettable experience for you. 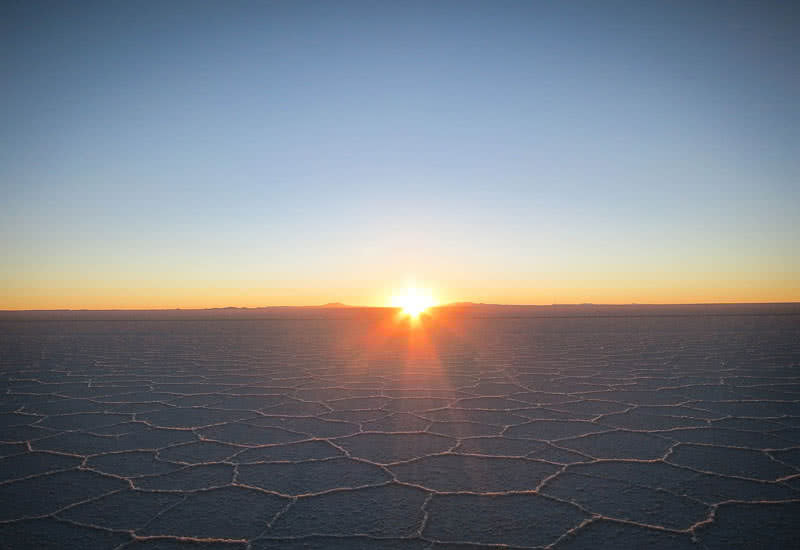 The Sunrises and Sunsets in Salar De Uyuni are also stunning. Probably the most famous tourist attraction of South America. This fascinating Inca ruin located at an altitude of 7972 feet, on the Andes mountain of Peru. Machu Picchu covers an area of 5.09 square miles. The site contains many stone structures, temples, palaces and store rooms. Machu Picchu was built back in 15th century by Inca emperor Pachacuti. It was abandoned in the 16th century after the invasion of Spanish Army. The site was recovered by American historian Hiram Bingham in 1911. 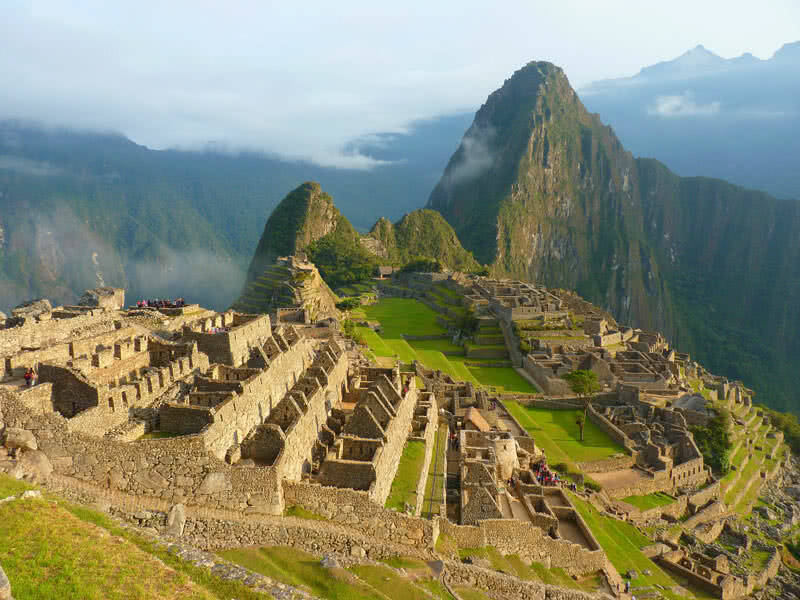 Considering the cultural value, UNESCO enlisted Machu Picchu as a world heritage site in 1983. Heavy granite blocks are the main material used for the construction of Machu Picchu. Some of such building blocks weigh more than 50 tons. The most surprising thing about Machu Picchu is no mortar was used for its construction. The huge granite blocks were cut so precisely to fit together tightly. Hiking the Inca trail is the best way to reach the Machu Picchu. It normally takes 4-5 days to hike the 26 mile long trail. During the journey, you could enjoy the beauty of surrounding mountain and lush forest.